Walking is often a really useful way for people to look after their mental wellbeing, as well as their physical health. Sometimes, however, finding the time to keep this activity going daily can be difficult – people often need to get to places quickly due to their busy lifestyles and therefore rely on cars or other means of transport. Often, on HOPELINEUK, walking is an important part of people’s plans to keep themselves safe – often, it can act as a distraction technique, a way for people to relax or to have time and space to think. So, how can this healthy alternative be incorporated into our busy lives? Walking to work offers a healthy alternative that has many benefits for people. 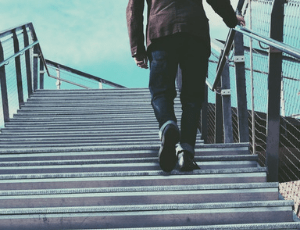 This article will explore these benefits and how walking to work positively impacts on people’s lives and, in turn, their thoughts of suicide. Firstly, walking to work can help people keep physically fit – it can help people burn calories, raise a person’s heart rate and strengthen bones and muscles. Not only this, but frequent exercise is a sure way to reduce the chances of certain illnesses – for example conditions like diabetes or high cholesterol are less likely to occur if you walk to work. Walking to work, like with any physical exercise, releases endorphins. The release of the ‘happy hormone’ can then have a positive impact on a person’s mental health – this can be imperative if a person is experiencing thoughts of suicide. Incorporating walking as a daily part of a person’s life can therefore be essential – it can also significantly reduce stress levels. As well as the positive impact on a person’s health, it can also have a positive impact on your wallet. Walking to work means that people save on petrol and bus and train fare – thus, this extra money saved can be really helpful! Not only are there benefits for yourself, but walking to work can also be really beneficial to the environment – it means that there are less CO2 emissions being released into the atmosphere which can therefore make a positive difference to the world. All in all, walking to work has many benefits – so, if it’s in walking distance maybe it’s worth giving it a try!